Should You Worry About Market Fluctuations? You turn on the television and watch a news story about housing prices going down. Then you receive a flyer in the mail about a property around the corner that sold for a decent price. Next you read a newspaper article about the housing market on the upswing again. It’s a little like being on a roller-coaster ride! Unfortunately the ride isn’t much fun if you’re thinking of buying or selling a home. In fact, it can be very confusing and frustrating. You just don’t know if “now” is the right time to make a move. In reality, the housing market has been fluctuating for decades. Yet, people sell their homes every day for good prices, and just as many people get into their next dream homes affordably. 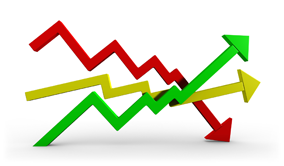 When you hear news of market fluctuations, there are two important things to consider. First of all, a lot of media information about the housing market is national, or at least regional. If the housing market is trending up or down nationally, remember that it doesn’t necessarily mean that your LOCAL market is doing the same. In fact, it’s entirely possible for housing prices to be rising in your area, while they are falling nationally, and vice versa. Secondly, if you’re selling a current property while buying another home, then the net effect of market fluctuations may cancel out. Say, for example, that the local market is on the upswing. You’ll probably be able to sell your current home for a good price. However, the home you purchase will likely also be priced to reflect the upswing. The same holds true when the market is down. All that being said, there are some circumstances in which you need to consider market fluctuations when deciding whether or not to make a move. A good REALTOR® will help.